For years, a graveled lot directly north of Kenton Park in North Portland’s Kenton neighborhood, sat vacant. But on June 5, a work crew arrived on North Argyle Street to begin transforming the empty site, roughly an acre in size, into Kenton Women’s Village, a temporary intentional community the likes of which the city has never seen. A half-dozen neighborhood residents spread across an adjacent southern slope. Some tore out invasive blackberries and other weeds; others used picks and shovels to clear way for a staircase that would connect the lot to Argyle Street. Three small bulldozers zipped around the site, delivering piles of dirt and gravel and leveling the packed ground. 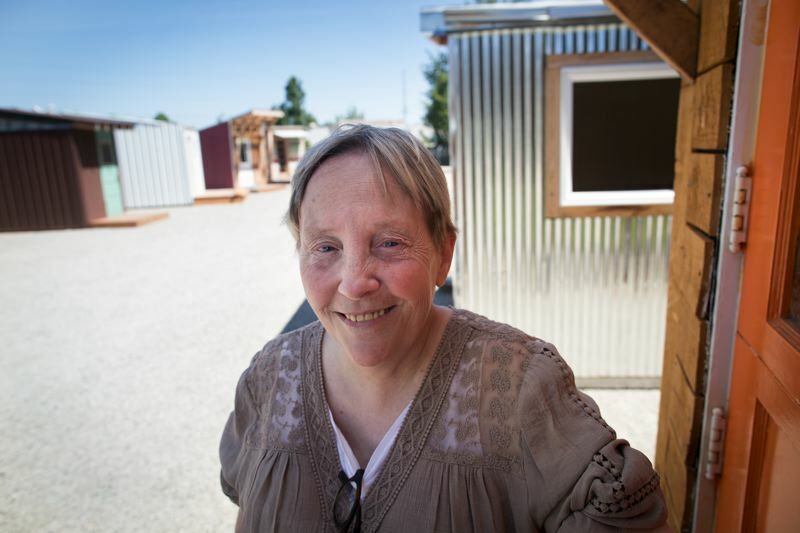 Debbie Haskett, a 55-year old-woman who has been homeless for eight years, walked to the far end of the lot where 14 “sleeping pods,” super-tiny homes approximately 96 square feet each, stood in an oblong semi-circle. Haskett, one of 14 homeless women chosen to occupy the structures, was deciding where to live. She chose a pod at the far end of the semi-circle that was painted black and turquoise. “Turquoise is my birthstone,” she said. She rubbed her hands together at the thought of a home, however small, that she could claim as her own. “I’m so excited,” she said. Portland has been a leader in the homeless village movement since a group of homeless agitators wrested control of a vacant city-owned property near the Portland International Airport in 2000, cobbled together a cluster of shacks on it, established a system of self-government, and named it Dignity Village. Dignity Village had antecedents in Seattle and Los Angeles, which it outlived, establishing itself as what appears to be the longest continuously sited community of its kind in the country. Although the model didn’t immediately proliferate in Portland, it persisted. A second group of homeless individuals pitched tents on a prominent Old Town/Chinatown corner in 2011; that settlement, Right 2 Dream Too, recently moved to a parking lot near the Moda Center. A third group launched Hazelnut Grove, to much controversy, in late 2015 in North Portland’s Overlook neighborhood. But Kenton Women’s Village, which opened to residents on June 10, is different from these predecessors. It’s physically different. Tucked on expendable lots out of public view, Portland’s other villages evolved from tent encampments and share an improvised, homemade look. Kenton Women’s Village sits on prime real estate in an established residential community, a tidy collection of clean-lined, sturdy tiny homes designed by 14 different local architecture firms, shepherded by Portland State University’s Center for Public Interest Design. It’s socially different. Portland’s other villages are resolutely self-governed communities; residents make up their own rules and hold one another accountable to them. Residents of Kenton Women’s Village will do the same, but within limits that don’t apply at other villages. The village is operated by Catholic Charities, which has a contract with Multnomah County to do so. Each resident had to pass a criminal background check, will have an assigned case worker through Catholic Charities, and will agree, as a condition of her residency, to actively work toward moving back into permanent housing. There will be 24-hour security and a full-time, professional village manager. And it’s politically different. Dignity Village, Right 2 Dream Too and Hazelnut Grove were founded as acts of civil disobedience. Groups of homeless individuals built settlements on public properties, without permission, in protest of city laws prohibiting public camping. But its creators conceived Kenton Women’s Village as a publicly backed, community-supported venture. It is sited on land loaned by the city, funded with city and county dollars, approved by a vote of the Kenton neighborhood association, and designed and built with the help of hundreds of volunteers. Not coincidentally, Kenton Women’s Village is designed to be temporary. Organizers promise to remove the settlement within a year. The sleeping pods will be hauled to another site, if an appropriate one can be found. Catholic Charities aims to help at least seven of the 14 residents find permanent homes, but it’s possible some will be referred to shelters at the end of the year. That’s a risk the residents, who would otherwise spend the coming year sleeping in shelters, alleys or in the woods, appear more than happy to take. Catholic Charities case manager Bernadette Stetz contacted the women to let them know they’d been accepted. “Their reactions were crying, screaming, like ‘I feel like I won the lottery,'” Stetz recalled on June 9, her voice quavering. 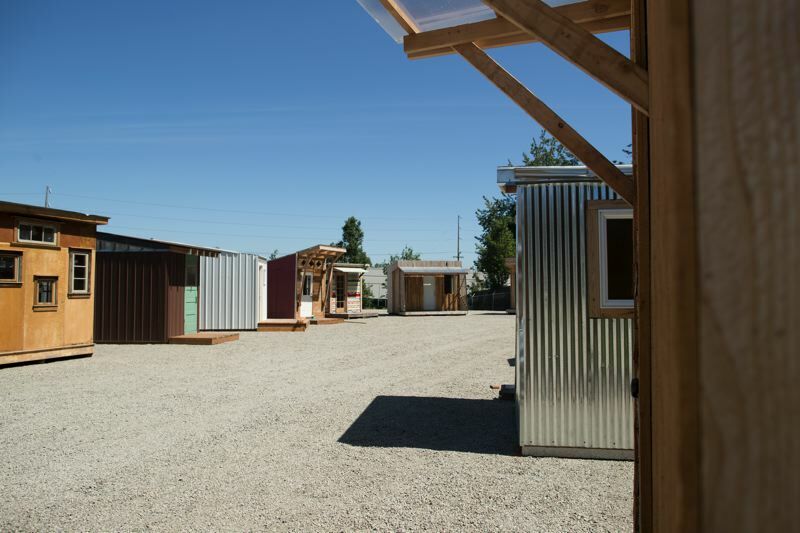 PORTLAND TRIBUNE: JAIME VALDEZ – Each of the 14 “sleeping pods’ in Kenton Women’s Village is about one-third the size of a typical tiny house. They’re small enough that a forklift can transport them. They’re big enough to hold a twin bed, some shelving and storage and a small space for a desk. Whether one classifies Kenton Women’s Village as a mainstreamed homeless village or as a radically reoriented homeless shelter, organizers consider it a model strategy for addressing the city’s out-of-control homelessness crisis — one that could be replicated in other neighborhoods. The driving force of the project is the Village Coalition, whose members include residents of Dignity Village, Right 2 Dream Too and Hazelnut Grove. They say villages offer something shelters don’t: a secure, reliable place to sleep and store belongings. More than that, villages give residents a sense of self-determination, common purpose and belonging, keys to healing and self-transformation that even transitional and permanent housing options can’t often match. Those benefits, coupled with villages’ relatively low cost of construction and operation, make villages a better public investment than shelters, advocates say — if they can be structured, as Kenton Women’s Village has been, in a way that appeals to neighbors. That hopeful idea has attracted a small army of supporters, while eliciting skepticism on various sides. At one extreme are Portland residents who say that homeless villages, government-backed or not, are public nuisances: unlawful, unsafe, unhygienic and apt to attract criminal behavior that burdens surrounding neighborhoods. At another extreme are some longtime homeless activists who see the transitional-housing model being attempted at Kenton Women’s Village as a watered-down version of first-generation homeless villages: politically palatable but, without homeless residents truly in charge, unlikely to sustain momentum. In between are policymakers who see villages as a helpful but incomplete model for addressing homelessness, better than some alternatives but not proven effective at moving chronically homeless people — 46 percent of whom experience severe mental illness and/or substance abuse disorders, according to the National Alliance on Mental Illness — into permanent affordable housing or true self-sufficiency. But regardless of whether they can cure mental illness, make neighborhoods safer or advance the movement for homeless empowerment, many are betting that enclaves modeled after Kenton Women’s Village could be a scalable answer to an undeniable and pressing conundrum: With permanent affordable housing in short supply, and mental health and addiction treatment services limited, chronically homeless people must live, sleep and move their lives forward somewhere. And, as the 14 women settle in to their new 96-square-foot homes in Kenton, “Giving Ground,” an investigative series produced by the Open: Housing Journalism Collaborative, will explore diverse perspectives on homeless villages. What is their role in addressing the needs and aspirations of homeless residents, and what is their place in the physical, social and political fabric of the city? We’ll talk to homeless individuals, activists, policymakers, philanthropists, scholars and Kenton neighborhood residents, asking those closest to the issue what they know, and hope to discover, about the past, present and future of homeless villages in Portland. PORTLAND TRIBUNE: JAIME VALDEZ – Debbie Haskett (left), a new resident of Kenton Women’s Village, and her caseworker, Bernadette Stetz (right), sit on the porch of one of the 14 tiny homes that make up Kenton Women’s Village. Haskett has been homeless since 2009 and spent many of those years camping in and around the Kenton neighborhood; Stetz hopes to help her find permanent housing this year. Haskett became homeless in 2009, after her children’s father died from cancer. “I had no income coming in,” she said. She moved from Indiana to Washington, then to Portland in 2013. Haskett talks with a slight Southern drawl; her face is lined with deep wrinkles, and she is rail thin. She collects bottles and cans to get by. She camped along the Columbia Slough for two years, including last winter. “It was really rough. Especially with the snow. It was terrible,” she said. She first learned about Kenton Women’s Village while watching the evening news. She asked her doctor to look it up on the Internet, wrote down the number for Catholic Charities and became the first person Catholic Charities selected to live in the village. “We’ve been working with her since day one,” Bernadette Stetz, Haskett’s Catholic Charities case worker, said. Haskett hopes to start a vegetable garden this summer—her mother, she said, was a “green thumb” and taught her how to garden. Margi Dechenne, program manager of the housing transitions program of Catholic Charities, said she has gotten offers from people in Kenton and other parts of Portland to support the village, including from people who want to offer carpentry, yoga, cooking and—yes—gardening classes. Asked what about living the village she’s most looking forward to, Haskett answers simply: having her own place; feeling safe. “I’m glad they got the gate fixed to where it will be locked at night. That’s the main thing right there,” she said. This article was first published in the Portland Tribune, part of Pamplin Media Group. It was produced by the Open: Housing Journalism Collaborative, which includes the University of Oregon Agora School of Journalism, Portland Tribune and KGW News.